In the summer of 2012, I was in DC for a conference held at the Gaylord National Convention Center. 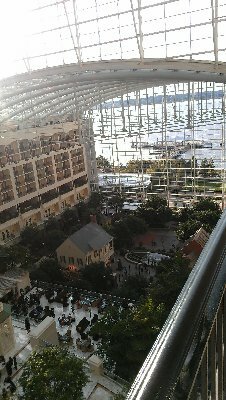 My room had a view of the "atrium," the huge glass-enclosed courtyard facing the National Harbor. As you can see, if you head down into the thick of it, it's like you're in a small town with trees and mini-buildings inside the courtyard. Certainly cool to say the least.